Hot Embossing Lithography (HEL) is a Nano Imprint Lithography (NIL) method using controlled temperature and pressure during the imprint process. It permits to replicate patterns which dimensions can be as small as few tens or hundreds of nanometers. Unless the substrate is itself a thermoplastic material, such as polycarbonate for instance, it is coated with the hot embossing material (thermoplastic resist or polymer) using spin coater. The stamp is aligned to the substrate. The accuracy requirement varies with the application. 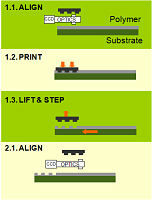 For some single or first level application, there is no need for alignment: a rough pre-alignment can be sufficient. To transfer the stamp patterns into the material, the stamp and the substrate are heated above the glass transition temperature of the resist material to soften it and to minimize the force required for the material to flow into the stamp cavities. After the pattern is imprinted into the material (pattern transfer), the temperature of the substrate and the stamp return below the Glass Transition Temperature (Tg) of the material, the stamp is separated from the imprinted material layer which retains the features transferred from the stamp patterns. The NaPa library is a collection of 27 processes, recipes, references performed in the field of nanopatterning. It aims to enable researchers and engineers to choose from different processes depending on the specific challenges of a new application. 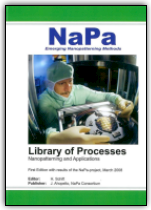 The NaPa "Library of Processes"
is now available for download on the NaPANIL's website. it is a must read for all! NaPANIL is a NMP thematic priority European-funded Framework 7 Large-Scale Project, bringing together 18 partners from: industry, academia, and private institutes, to achieve ambitious goals. Click here to learn more about the European NaPANIL Project! This FREE 152 pages book gives all directions needed to chose and apply an alternative nano-patterning technique: it is a must read for all! => Please click on Direct Link to download it! => Please click on Begin Search, type "schmitt" as person and "nanoimprint" as keyword. => Then you will access to all latest papers!